The Transverter system has vastly more data, communications and configuration control than anything else. What this does is create the tools for many Transverter systems to work together as a MicroGrid. This allows Transverters to share energy assets with the neighboring nodes and document the energy transactions to feed into business models. The idea is to have lots of small MicroGrid nodes where each node can operate by itself, autonomously, yet has the ability to intelligently share energy with the entire MicroGrid. 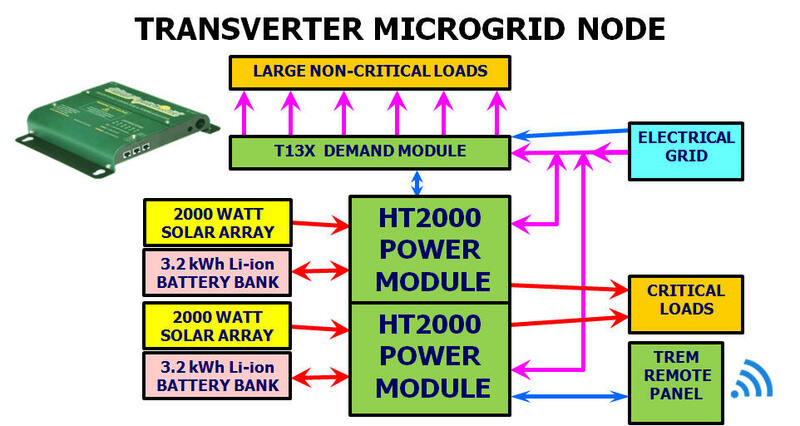 The Transverter's unique capabilities for MicroGrids allow the individual nodes in standalone microgrids to be smaller, since they can share with their neighbors. Microgrids often have to create their own electrical infrastructure with transformers, generators , wiring and even substations. The synchronized cooperation between the Transverter MicroGrid nodes can almost always cut the size and cost of these elements in half and often to only 25%. In most developed areas there are ancillary services programs in place and Transverter MicroGrids are often large enough, with all nodes aggregated, to participate, creating a whole new revenue stream. All Transverter nodes are designed to automatically break away and operate autonomously giving the ultimate in energy security. Imagine you have 4 of these MicroGrid nodes in a small community with 4 houses and a 6,000 watt generator. Initially, the generator is not running so each of the 4 nodes operates independently so the critical loads of each node are powered by that node's solar and batteries only. At that point, the non-critical loads have no power. Now, imagine the 6,000 watt generator comes on. Each node thinks it is the grid and synchronizes with it and connects. Now all of the large non-critical loads have power, but they don't just have the 6,000 watts from the generator, they also have 4,000 watts from each node meaning there is 22,000 watts available. At this point, energy can flow along the purple lines between any of the energy elements in the entire system. This means, for example, that a solar array from house #1 could actually charge a battery from house #4 and the data log system would automatically keep track of that transaction if they want to value it in a billing system However, there are limits on how much battery power and solar power is actually available at that moment and it could happen that all of the loads put together exceed the total capacity of the entire system. When that starts to happen the generator reaches its maximum capacity and starts to slow down so its output frequency drops. Every T13X Demand Module is analyzing the frequency of every single wave shape to an accuracy of 1/100th of a Hz and every single load in each T13X has its own configured disconnect frequency. This means that as soon as the generator reaches capacity that loads start to disconnect in an ordered prioritized fashion until the generator is no longer above capacity. Each load also has its own individual configured reconnect frequency as well as its own reconnect delay time. This guarantees a smooth stable system where the entire neighborhood becomes one integrated frequency control system that guarantees that it is impossible to overload the generator. This is the secret to making a MicroGrid where the maximum value is derived from all of its components, making it affordable. Every element of every node is completely configurable so limits can be set on exactly how much of each asset was to be shared and under what conditions. Instead of 4 homes it could be 400 homes or an entire city. •EACH HOME HAS AUTONOMOUS OPERATION OF 4 KW 120/240 VAC 60 Hz OR 50. •MICROGRID LINKS 6 KW GENERATOR FOR TOTAL CONTROLLED LOADS UP TO 22 KW. •ALL HOMES HAVE CONTROLLED ACCESS TO ALL NEIGHBORHOOD ENERGY ASSETS. •COMPLETE MONITORING AND CONTROL OF LOADS WITH T13X. •IF GENERATOR REACHES CAPACITY AUTOMATIC PRIORITIZED CURTAILMENT OF LOADS TO GUARANTEE IT IS IMPOSSIBLE TO OVERLOAD THE GENERATOR. Even without the generator we can create an energy sharing MicroGrid structure. We feed the AC output of house #1 into the AC input of house #2 so that house #2 thinks that house #1 is the grid and synchronizes to it. Since Transverter power modules have bi-directional capability, either house can use their resources to help power the other house. Again, the amount of sharing is controlled by the configuration settings. House #3 connects to house #2 in the same way in a daisy chain configuration and you could have 20 houses all sharing power back and forth to increase their access to power far in excess of the assets they actually have in each individual house. There are limits with this but the maximum load that could be supported on each house would be increased from 4 kW to 18 kW with the help from their neighbors. This system has a communication port on each node so there is a master controller that enforces some reasonable rules on energy sharing. It also has all of the information needed to apply billing for energy exchanges. In fact, all of the Microgrid nodes could be owned by the developer who could operate a Power Purchase Agreement (PPA) with each of the homes. 450 HOMES AVERAGING 17 KWH/HOME/DAY. 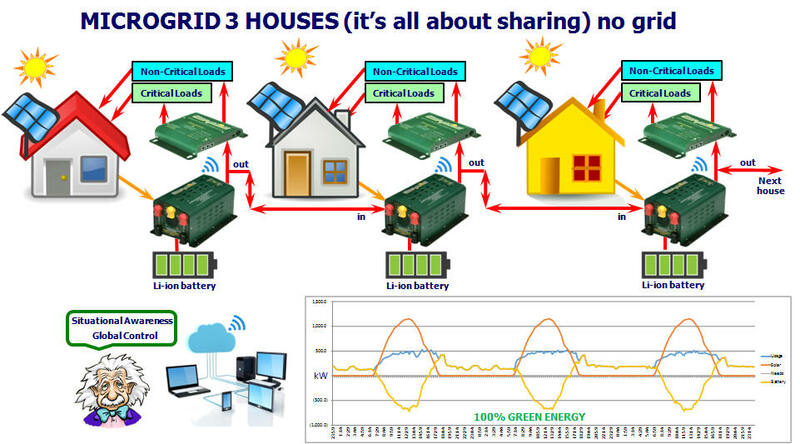 MICROGRID ENERGY SHARING BETWEEN HOMES. •NO GRID OR GENERATOR SUPPORT AT ALL. •1.8 MW SOLAR, 1.8 MW TRANSVERTER POWER MODULES, 2.5 MWH LI-ION BATTERIES, TRANSVERTER AUTOMATIC DEMAND CONTROL. •900 HT2000 POWER MODULES AND 900 3.2 KWH LI-ION BATTERIES, BOTH WITH 10 YEAR WARRANTY. •LEVELIZED COST OF ENERGY OVER 20 YEARS = $.14/KWH. 25 YEAR EXPECTED LIFE. •EACH HOME CAN OPERATE AUTONOMOUSLY FOR ABSOLUTE ENERGY SECURITY. This system has the grid or a generator. The AC inputs of each Transverter power module are connected directly to the grid. When the grid or generator are active then energy can flow between any elements of the system under the regulation and documentation of the master control center. This can limit total demand on the grid or generator by using stored energy from batteries, solar array and by controlling non-critical loads. When there is any fault or problem with the grid then each node breaks apart and powers its critical loads with its own energy resources giving the ultimate in energy security. When all of the nodes put together total over 1 MW then the system can aggregate all of the nodes so the entire Microgrid looks like one well behaved system and they can participate in Ancillary Services like Demand Response, Frequency Stabilization, etc. These can create a new revenue stream that can exceed the revenue from the solar alone. •USAGE = 8,370 KWH/DAY. 600 KW PEAK DEMAND. TIME OF USE RATES CALIFORNIA PG&E. •900 KW SOLAR, 900 KW TRANSVERTER POWER MODULES, 1.2 MWH LI-ION BATTERIES, TRANSVERTER AUTOMATIC DEMAND CONTROL. •450 HT2000 POWER MODULES AND 450 3.2 KWH LI-ION BATTERIES, BOTH WITH 10 YEAR WARRANTY. •TOTAL INSTALLED COST OF $4,121K. •DEMAND REDUCED TO 37% AND GRID USE TO 44%. SIMPLE ROI OF 7.7 YEARS. •900 KW UPS LEVEL BACKUP SUPPORTED BY 1.2 MWH OF BATTERIES AND 900 KW OF SOLAR. •ENHANCE SIMPLE ANALYSIS WITH ANCILLARY SERVICES. •900 KW SOLAR AND 1.2 MWH LI-ION BATTERIES DIPACHABLE ON DEMAND IN BOTH DIRECTIONS. 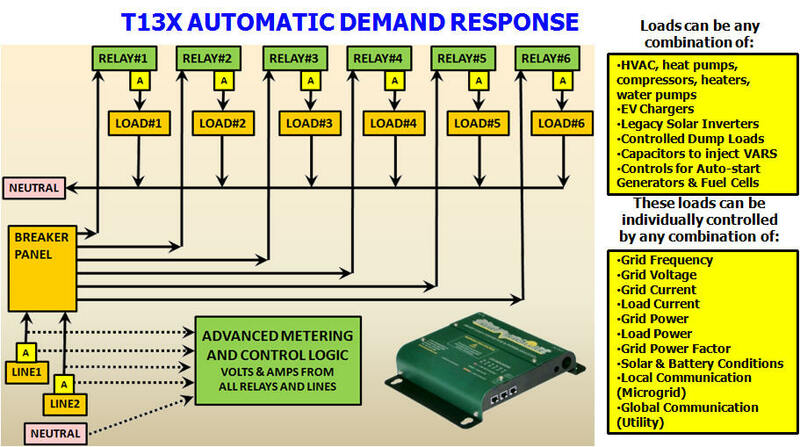 •CONTROLABLE DEMAND RESPONSE FOR SELECTED LOADS. •PATICIPATE IN 15 MINUTE SPOT ENERGY MARKET DIRECTLY WITH ISO. •OTHER INCENTIVES LIKE SGIP AVAILABLE. •DATA & CONTROL CAN BE AGGEGATED FOR LARGER VIRTUAL SYSTEM. •GENERATOR DOWNSIZED TO 37%. INFRASTRUCTURE DOWNSIZED TO 37%. The T13X (Patents Pending) gives real time visibility and control of loads. This can allow prioritized control of the entire system as well as protect the loads from ever being powered by power that is out of spec, which could damage the load. 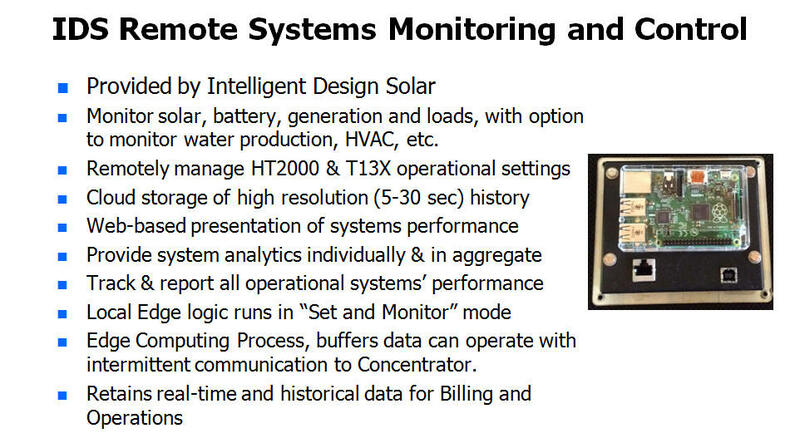 The T13X also includes monitoring of the grid connection for that node or can monitor the entire grid connection for the Microgrid. All of the currents and voltages are monitored with oscilloscope level detail so response can be specified with great detail and actions can be taken very quickly, usually within 8 ms.
One of these IDS plug computer is attached to each node so it can communicate to the local area network and to the cloud via Ethernet or Wi-Fi. This allows for real time coordination of all of the nodes taking into account the entire energy situation. Each IDS node has geographical location information so aggregation can be made over any defined area. This can be accessed from anywhere via the internet with proper security permissions. Detailed graphs and system status are available. This data can feed into other databases like the OSIsoft Pi database that is used by most utility companies and ISO's. Data centers can be thought of as a special case for MicroGrids where it is broken up so that each server rack is a separate node making for the ultimate in energy security. When you get this quantity of systems with autonomous stand alone capability, coupled with all of the Smart Grid features, the possibility of breaking off large sections of neighborhoods or entire buildings as microgrids becomes very attractive. Delayed load application and soft starting. Microgrids have a combination of power sources but they have more limited power resources than the grid itself. When a Microgrid generator comes on it has to start all of the inductive motors that are connected and these take several times more power to start than to run. This can easily overwhelm a limited power generator. With the Transverter nodes in the Microgrid there is a delay of several seconds after the generator is connected before the Transverters begin to connect. When they do connect they do a soft start which takes another several seconds. (What happens here is that before the generator comes on, the Transverter is running the critical loads from the battery and it very gradually shifts the loads from the battery to the generator after the generator starts). Then, even later, the Transverters very gradually apply the battery charging load. This also injects programmable delays of the larger loads so that the generator has time to start all of the hard connected loads and stabilize before these loads are selectively added. After they are added they cycle between the larger loads so that they take turns and do not all come on at the same time. This, combined with the Delayed Load feature, allows the same Microgrid to be run on a generator with half the power of a Microgrid without the Transverter systems. 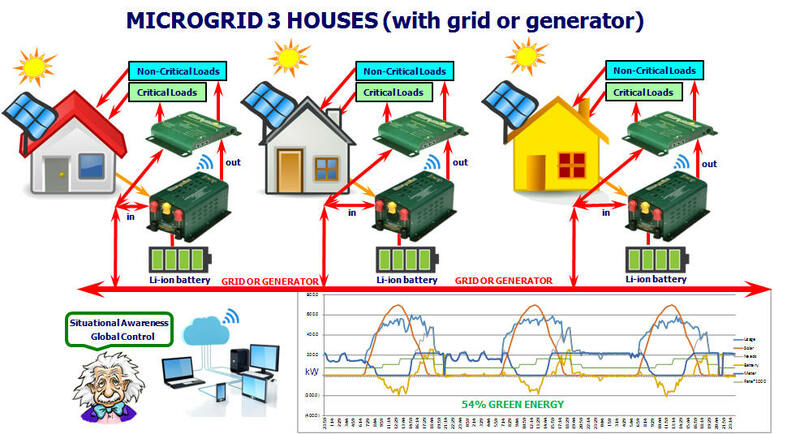 In fact, with an active communication system between houses, the larger loads would be dynamically cycled on and off so that the Microgrid could always handle the combined load. 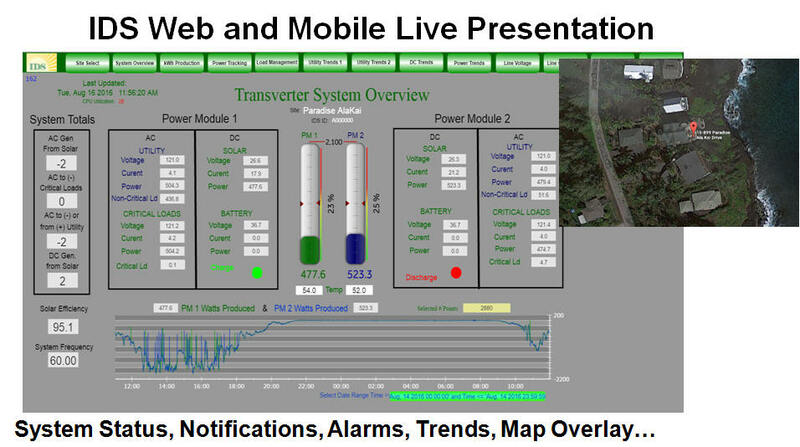 With these features and an active communication network you could have all kinds of nesting and sub nesting for microgrids within microgrids, etc. The real deal here is that, with the Transverters used as elements of a Microgrid, the Microgrid can be made for a fraction of the normal cost and operate automatically. 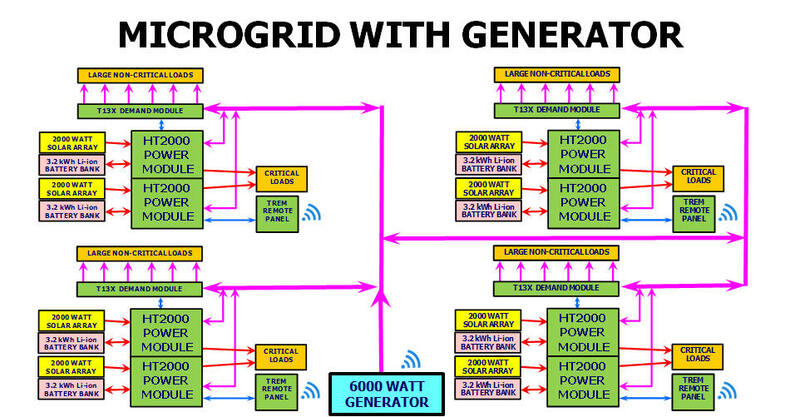 To really appreciate the opportunities and advantage of the Transverter technology you really have to understand the basics of the evolving definition and concepts of MicroGrids. A very current report has been created by NEMA Electrical Manufacturers Lay Out Microgrid Strategic Vision. You should really download and read the complete report Powering Microgrids for the 21st-Century Electrical System. They even have it in a tablet version for Kindle and iBooks. Look at Figure 5 on page 10. The Transverter with the IDS cloud system already implements the elements listed as "sensitive and critical loads", "Adjustable loads", "Centralized electrical storage", "controllable loads" and much of the functions of the "Microgrid Controller". They give the impression that this is very much a new field but, with the Transverter & IDS, this if way more advanced and ready to deploy than they imply. Look at the price ranges in Table 2 on page 18. This assumes that they are using the same centralized electrical infrastructure that has been used historically. This has elements like transformers, switch gear and even wires that have all been designed to handle the peak loads at an enormous cost both in CAPEX and efficiency. 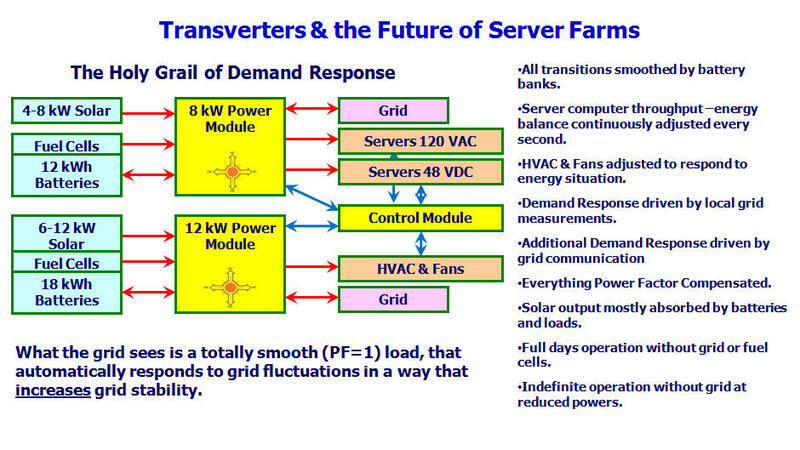 A typical Transverter based microgrid has local generation with complete local control of all loads yet has the ability for these nodes to separately share. This typically can reduce the peak loads of the entire microgrid to less than 25% of their normal non-smart value which means that all of these infrastructure elements, like transformers, switch gear, wires and even backup generators, are reduced to 25% of their normal size. The cost impact of this reduction can often pay for the entire microgrid development, including the solar panels and batteries. On page 22 & 23 they list "Evolving technologies for microgrids". It is important to note that the Transverter technology combined with IDS plug communication and cloud database has already developed every single item on their list with an active system for its functionality and coordination and cooperation to continually evolve. Keep in mind that this is a US oriented document where the electrical infrastructure is almost always already in place and very evolved. The fact that we can potentially reduce infrastructure elements that already exist doesn't give such an immediate cost benefit, although it will if you play it out over the replacement life of the elements, like 20 years or so. However, look at the systems we are doing with new developments in Africa where they have to make the local infrastructure from scratch because it is a new project and it is connecting to a surrounding energy infrastructure that is minimal, unreliable or even non-existent. Now this 75% reduction in infrastructure elements is a very big deal. Look at phones as an example. They developed as a wired system and when cell phones came along it was an expensive add on and cell phones started out slowly taking over. Compare that to the developing world and you can see the cell phones completely leapfrogged wired phones and wired phones will never be installed in these areas. The same is true for the electrical grid and the Transverter IDS solution is how they can already do this today. It very well may be that these developing world microgrids will completely Eclipse the North American and European microgrid developments. These are truly exciting and interesting times.